Guam High Panther Keith ‘Trip’ Chauret III revealed which Division I school he would strap up for next season. The press gathered at the Guam High school when Chauret revealed he will be attending Jacksonville University. “It’s been a long and rigorous process,” said Keith’s mother Heather with a sigh of relief. 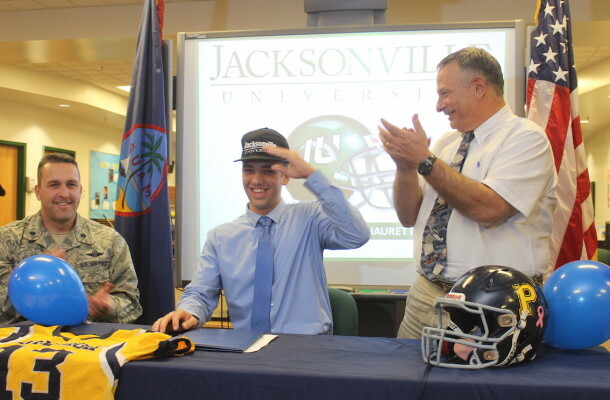 Of 13 schools, Chauret chose Jacksonville University with his family swaying his decision. The Chauret’s will be relocating which made Chauret’s decision easy wanting to be closer to his family. Chauret will also be pursuing a medical career which was another big reason Jacksonville was his top choice. The school had laid out their entire curriculum and did completed the VA process for Chauret which highly impressed mom and dad. “We’re giving our son to them for the next 4-5 years to raise so we just wanted to make sure that he’s going to be in good hands and we couldn’t be more proud of him,” added dad Keith. Not in attendance was Panther head coach Jacob Dowdell, who was said to be checked into the hospital during the time of the press conference. Dowdell’s involvement was a driving force in Chauret’s Division I signing, working profusely with the family and coaches from Chauret’s first day of football. “I never knew I had the potential to play college football until I met coach Dowdell. He would be up on the phone at times like 3 a.m. speaking with college coaches and his involvement in everything is one of the biggest reasons I’m here today,” added ‘Trip’. As far as Jacksonville is concerned, coach Ian Shields and the program were thrilled in Trip’s choice. “The coach was unaware we were calling him to verbally commit and was trying to feed us key points for nearly 30 minutes and we never got a word in. At the end of it, ‘Trip’ said, ‘I was calling to let you know that I verbally commit and he was ecstatic. We probably stayed on the phone for another long hour,” laughed Chauret’s mother. Chauret was rejected majority of the schools he had applied for since they didn’t have the chance to see him perform in person. That’s where his tapes of the season played a huge factor as becoming the only source material that coaches could see Chauret’s skill. Chauret is the first Panther to get a DI offer with former teammate Lewis Harris signing to Pima College, a DII school last year. One thing that was often expressed from Chauret’s father Keith was that the talent level of Guam is as good as the stateside talent and that he believes that a D1 school can be future for a handful of Guam’s young football stars. “When ‘Trip’ went out to participate in the All-Star game he fit right in and that has a lot to do with the level of competition he was facing here on island. I can easily see some of these kids starting for a DI school in the future,” said Keith senior. ‘Trip’ will graduate from Guam High this Spring and does intend to run track for the Panthers in the 4th quarter.